by Israel, Barbara A.; Eng, Eugenia; Schulz, Amy J.; Parker, Edith A. 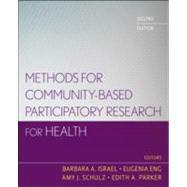 This thoroughly revised and updated second edition provides a step-by-step approach to application of participatory approaches to qualitative data collection (including structured and unstructured interviews, observations, and group interviews) and data analysis (including constant comparative method, coding schemes, and theme memo). Some of the methods included are: survey questionnaire, in-depth interview, focus group interview, ethnography, exposure assessment, and geographic information system mapping. This book brings together many of the leading scholars who are teaching and conducting CBPR in health and related fields to provide readers with strategies and lessons learned for how to apply different methods using a partnership approach. Barbara A. Israel, DrPH, MPH, is professor, department of health behavior and health education at the School of Public Health, University of Michigan. Eugenia Eng, DrPH, MPH, is professor, department of health behavior at the Gillings School of Global Public Health, University of North Carolina at Chapel Hill. Amy J. Schulz, PhD, MPH, is professor, department of health behavior and health education, at the School of Public Health, University of Michigan. Edith Parker, DrPH, MPH, is professor and chair, department of community and behavioral health at the College of Public Health, University of Iowa.